What excitement! For one thing my Facebook friend Ryan sent me a picture of an electronic fig card. 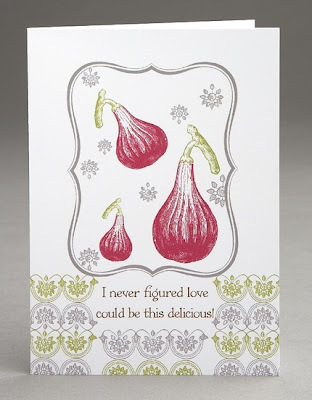 It is in honor of my fig lifestyle! That is it pictured above. Thank you, Ryan! May you enjoy many many ripe figs with the neck of a hanged man and the open shirt of a thief! For another thing yesterday was a two-concert day. 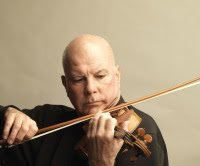 Last night I went to this wild recital by the violinist Elmar Oliveira at UB which, you can read about in my other Web log and hear the piece that drove me crazy. If you feel like it. If you do not, hmmmph. Howard suggested today that "Hmmmph" should be a proper English word. I used it already today in a message to my Facebook friend Toni Taber who went to Mass with me last week. Toni Taber said that owing to her niece's wedding she was not sure if she could join me this week. I hope she does not take offense! Toni, I was just kidding! So that was what I did last night, go to this recital at UB. My mom went with me. In the parking lot we ran into my brother Tony's friend Peter. You may not remember Peter but he took me for a ride in his convertible last summer at Tonyfest. Peter had two Russian friends joining him at the concert and we all sat together in the third row. We are not shy! We were right under the nose of Elmar Oliveira. Here is what he looks like. It was almost like when I shared the stage with the Guarneri Quartet. Peter was there too! Remember, he made me go backstage. After Oliveira finished one of his pieces one of Peter's friends announced "Bravo!" in his thick Russian accent. I am realizing how many Russians I know. That says something about my life! Just like I know not one but two men named Yuri. One is Yuri Hreshchyshyn whom I know from the Broadway Market and the other is Yuri Krasnopolsky, the conductor who was at Tanglewood the same summer as Leonard Pennario. So that was one concert I went to yesterday, Oliveira's concert. The other was a noontime organ concert at St. Paul's Cathedral downtown where I got to meet my Facebook friend Ward! 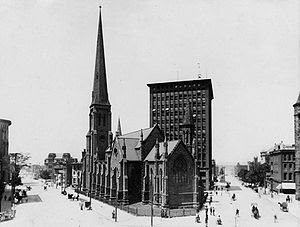 St. Paul's is the beautiful and historic Episcopal cathedral in downtown Buffalo on Church Street, which was named for it. When you walk in it gives you a nostalgic feeling as if you are in St. Paul's Cathedral in London. Here is a gorgeous old postcard of St. Paul's Cathedral. My dad was nostalgic for Shelton Square. He told me it was named after a dean of the church. I am watching the video I just linked to and my mother said the bird woman was from Lockport. See, even though my family is Catholic we are experts on St. Paul's Cathedral. Here is the video again in case you are too lazy to scroll up. 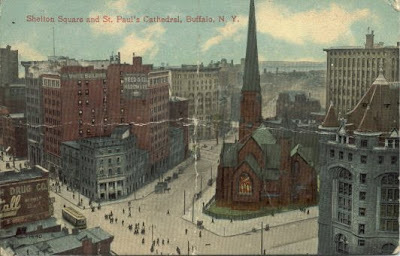 Here is a wintry picture I love of how St. Paul's looked before cars. My friend Jane and I went before the concert to a lunch at the church. It was delicious and served on ancient china with "St. Paul's Cathedral" stamped on it in gold lettering. I should have taken a picture but that would have meant not enough time to finish my cream of corn soup. So, no picture! I felt like a nerd at lunch because all I was interested in was asking people there if they knew my Facebook friend Ward and was Ward going to be at the concert. Ward is the warden of St. Paul's! I know, only in Buffalo. It is like the Jerome van der Water Water Treatment Plant. That is down by the river and I have bicycled past it many times. Anyway, I finally did meet Ward after the concert. Meeting a Facebook friend is a magical moment. It is like a character in a novel coming to life! Ward and I share an interest in Latin and in liturgy and we lingered in the back of St. Paul's after meeting each other talking about Credos and Glorias which, it is an honor to know someone like Ward with whom I can discuss these things. Now I go back to my normal life. No two concerts a day, no violinists with shaved heads, no meals eaten off of gilt dishes stamped with "St. Paul's Cathedral." Well, I can always eat. There is a bag of vegetables from the farm downstairs on the kitchen counter awaiting me now!